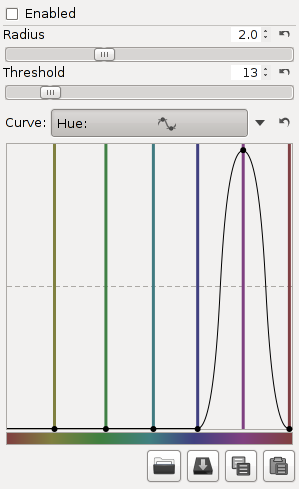 Defringe Hue curve to target only purple fringing. Purple fringes are a form of axial (or longitudinal) chromatic aberration, and appear along dark edges adjacent to bright areas due to incorrect focus, lens imperfections, or simply (but more technically) due to the nature of lenses not focusing all colors on the same plane. As lenses are optimized to focus visible light of longer wavelengths on the same plane, those shorter wavelengths farther away from the ones the lens was optimized for (i.e. purple, violet - wavelengths on the shorter side of the visible spectrum) can visibly tint dark regions when the bright areas are of sufficient intensity. This tool should be able to effectively remove most of them. Defringing is applied either in the Lab or the CIECAM02 space (if CIECAM02 is enabled). Consequently, enabling CIECAM02 may lead to slightly different defringing results, especially when using the Hue curve. Strong chromatic edge fringes are suppressed by averaging over a neighborhood of the specified radius. Sets a threshold for the application of defringing. You can use the Hue flat curve to specify which colors Defringe should target. The horizontal axis represents the range of colors, and the vertical axis the strength of fringe removal. This allows you to limit the action to a specific range of colors without affecting colors of other hues. If you place a purple dot at the top and keep the rest of the colors at the bottom, purple fringes will be removed with a maximal strength while other colors will not be affected. This page was last edited on 21 January 2014, at 10:04.